David Buchanan says there is no better game for Cobblers than an atmospheric encounter with Oxford United on Saturday. 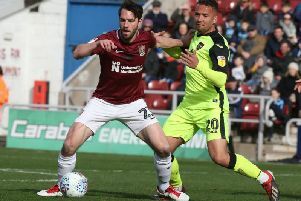 The in-form away side have sold out their allocation for the Sixfields clash, with Michael Appleton’s men keen to stay unbeaten in Sky Bet League Two. Cobblers go into the game on the back of four league games without a win, a run that was punctuated with a Capital One Cup defeat at Newcastle United and a Johnstone’s Paint Trophy win over Colchester United. And Buchanan clearly feels big games suit him and his team-mates, with the left-back relishing this weekend’s battle. “We’ve had a positive week of training and we’re looking forward to a big game,” said the former Preston North End defender. “It’s frustrating to have conceded two sloppy goals (in the 2-1 defeat to Dagenham & Redbridge) last weekend but we’re in it together. “It’s up to players to get round each other and if we can cut out those mistakes I’m sure we’ll be fine. “I know for a fact that in every game this year we’ve been in them, we’ve just given some bad goals away. “At the other of the pitch we’ve just got to do a bit more, be a bit more patient and create a few more chances and have a bit more belief in ourselves. “There’s no better game for us than the one this Saturday because we’re back at Sixfields again and there will be a big crowd here.